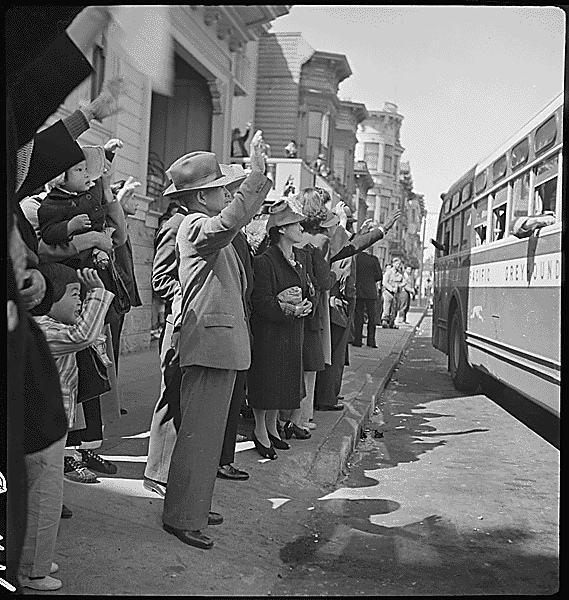 San Franciscans of Japanese descent during forced evacuation of the city in 1942. Photo by the Department of the Interior, War Relocation Authority. African Americans have been a part of San Francisco since before the Gold Rush. The city’s Black population saw its greatest increase, however, during World War II. Hailing primarily from Louisiana and Texas, the newcomers had been recruited to work in Bay Area shipyards. 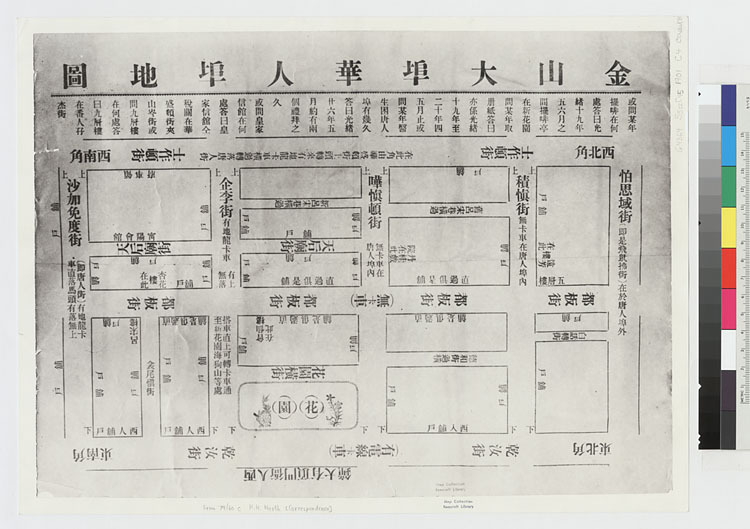 Many settled into homes in the Western Addition recently vacated by San Franciscans of Japanese descent who had been forced, under President Franklin D. Roosevelt’s Executive Order 9066, to relocate to internment camps. Over the following two decades, a visible African American presence established itself in the Western Addition neighborhood around Fillmore Street. This included a vibrant jazz and rhythm-and-blues nightclub scene that featured such artists such as Duke Ellington, Louis Armstrong, Billie Holiday, Count Bassie, Thelonious Monk, and Ella Fitzgerald. When Justin Herman took control of the San Francisco Redevelopment Agency in 1959, however, he oversaw the razing of much of the Fillmore and the forcible removal of Black residents from the neighborhood, bringing an end to the Fillmore jazz era. James Baldwin’s 1963 documentary, “Take This Hammer,” addresses the fallout; it can be seen online for free. 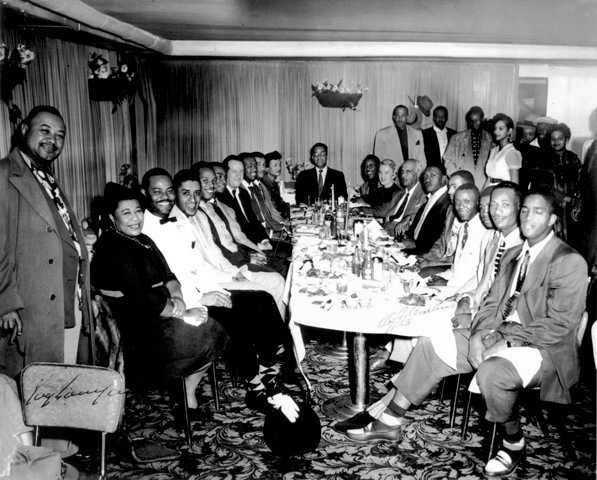 Ella Fitzgerald and Fillmore celebrants in the 1950s. Courtesy the Red Powell/Reggie Pettus Collection. Elizabeth Pepin and Lewis Watts have been working for many years to rescue the neighborhood’s Black music history – including Pepin’s work as associate producer on the 1999 KQED documentary, The Fillmore. 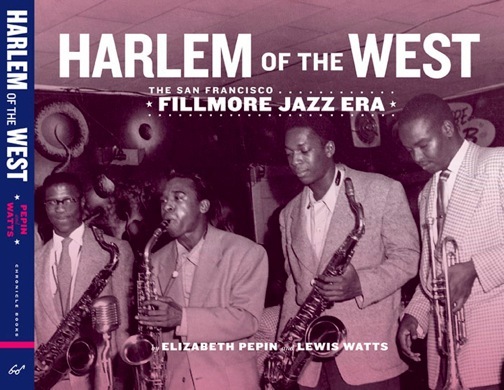 In 2006, they published Harlem of the West: The San Francisco Fillmore Jazz Era. The book was released with a companion website and an exhibit that traveled to venues including the Museum of Performance and Design in San Francisco and the California African American Museum in Los Angeles. Featured on the cover of the 2006 edition were, l-r: John Handy, Pony Poindexter, John Coltrane, Frank Fisher at Jimbo’s Bop City in the 1950s. Photo by Steven Jackson Jr. 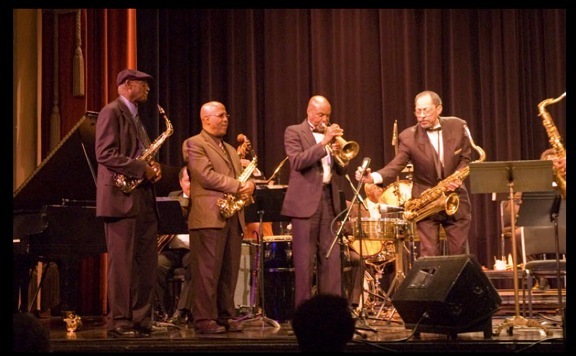 Performing at the Herbst Theater in conjunction with the 2006 publication of Harlem of the West were John Handy (2nd from left) and Frank Fisher (3rd from left) who had appeared on the book’s cover. Photo courtesy Lewis Watts. Currently, Pepin and Watts are preparing a revised edition of the book. It will feature a new design and Introduction, as well as additional material based on the oral histories they have recorded and photographs they have collected since the book was first published. In part, it was photographs that first prompted the creation of the book – specifically, pictures that hung on the walls of Red’s Shine Parlor, a shoeshine business on Fillmore Street. Following owner Red Powell’s untimely death, his photographs were rescued by Reggie Pettus, owner of the New Chicago Barbershop across Fillmore street from Red’s Shine Parlor. Pettus, in turn, made them available to Lewis Watts. 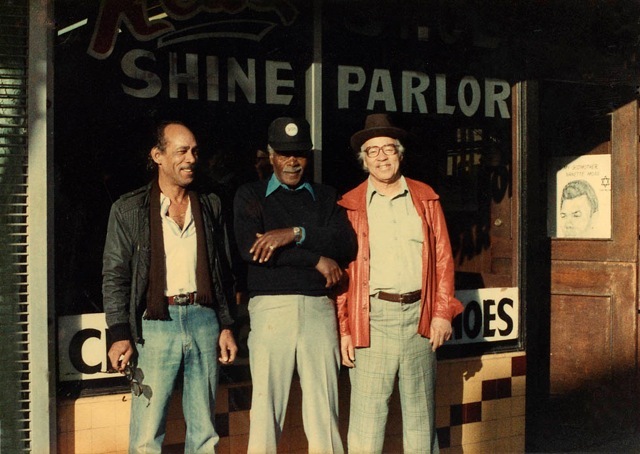 Red Powell (far right) in front of his shoeshine parlor in the 1960s. Courtesy the Red Powell/Reggie Pettus Collection. Many of the photos lacked information about the photographers and the people and places they portrayed. Elizabeth Pepin collaborated with Watts, who teaches photography at UC Santa Cruz, to identify the photographs. Pepin pursued her research at a time when little scholarship had done about African American history in San Francisco aside from a handful of works such as Douglas Henry Daniels’ Pioneer Urbanites and Albert Broussard’s Black San Francisco. Also at that time, Bay Area archival repositories such as the California Historical Society, the Bancroft Library, and the San Francisco History Center had little material about the city’s Black history. Elizabeth Pepin and Lewis Watts. Photo courtesy Lewis Watts. The Fillmore was pretty much gone by the time I entered the world. I didn’t feel I had the right to put my voice into that. Obviously, I’m choosing out of all the interviews. But really the book is written by the people who lived the history. I feel very strongly that this stuff needs to be available to the public. I think that there are many, many more stories to be told in the Fillmore. It’s important that this material be made available so that other people can put it toward their own projects. Pepin and Watts’s work is especially pertinent in light of the failure of other attempts to capture and communicate the Fillmore’s African American past. In 1995, the San Francisco Redevelopment Agency, which had previously decimated the Fillmore neighborhood, launched the mismanaged Fillmore Jazz Preservation District project. The mandate had been to commission permanent interpretive art installations, offer financial support for Black businesses, and establish jazz venues such as Yoshi’s as well as the Jazz Heritage Center (where material from Pepin and Watts’s work has been exhibited), but the results have been mixed. The neighborhood further suffered when a Community Benefit District, which was established in 2006 to promote Fillmore heritage and businesses, was shuttered in 2012 following infighting among the area’s businesses owners and residents. As part of the Fillmore Jazz Preservation District project, this sidewalk marker outside the Fillmore Auditorium originally read, “Malcolm X Spoke At The Fillmore Auditorium, 1962.” The brick that featured the name “Malcolm X” has been replaced, but his name has not. 2012 photo by Drew Bourn. Such disappointments make Pepin and Watts’s efforts to document and share the Black history of the Fillmore all the more vital. If you have photographs or can help identify persons and places in Pepin and Watts’s existing photograph collections, or if you might be willing to share your recollections of the period, please contact Pepin and Watts. Such contributions are welcome as they prepare their new and expanded edition of Harlem of the West. Map of San Francisco Chinatown, ca. 1901. Bancroft Library, University of California, Berkeley. G4364.S5:2C45 1901.C4. In recent years, a handful of projects have used online map programs such as Google Maps to provide access to historic images of San Francisco. These programs allow website creators or users to “geotag” digital versions of historic images – in other words, to situate the digital images on an online map. Some of these projects are examples of Web 2.0, meaning that users are able to make contributions by uploading images of their own, or add tags or comments to others’ photos. By considering some of these projects together, it is possible to compare their features. I’ll discuss five projects here, and then raise three issues related to this kind of work. One project is HistoGrafica. Users can upload images, as well as a free-text description of the image and its source. Users can also contribute to others’ photos by rating the image, adding it to a list of their favorites, recommending it to other users, or suggesting that the location assigned to the image may be incorrect. Images can be searched by location on the map or keywords that search the images’ descriptions, and search results can be limited to a range of years. Another project is Sepia Town, by Jon Protas, Eric Warren and Eric Lehnartz. Like Histographica, users can upload photos, provide a free-text description, indicate the image’s location, and identify its source. Images can be searched by a location keyword, geographic coordinates, or using the map, but keyword searches do not search the descriptions of the images. Also, the search results cannot be limited by a range of years. Sepia Town does, however, offer a split-screen “Then and Now” feature allowing the user to see an historic photo on the left and a contemporary Google Street View image of the same location on the right. Of course, users can make mistakes in identifying the location of the images they’ve uploaded. Because the site doesn’t offer the option to tag or comment on others’ photos, users would have to contact the website owners to suggest that any mistakes had been made. WhatWasThere is similar to Sepia Town in that users can search for images only by using the map or inputing keywords related to locations, and search results cannot be limited by a range of years. Whereas Sepia Town uses a split screen presentation to view both an historic image and a current shot of the same location on Google Street View, WhatWasThere allows users to superimpose the historic image directly over a shot from Google Street View and to adjust the historic image’s opacity using a slider bar. As with Sepia Town, in cases where an incorrect location is assigned to an image, there is not a means for other users to tag or comment on the image in order to suggest changes. Sometimes a map-based set of San Francisco historic images is presented in a Web 1.0 format, instead of a Web 2.0 format. This means that only the creators of the site can make changes or new contributions to it. One example is Dan Vanderkam and Raven Keller‘s project, Old SF. Vanderkam and Keller have used images and their descriptions exclusively from one source – the San Francisco History Center‘s online collection of historic photographs. Users can search for images on the map and can limit the search results by a range of years. The Web 1.0 format means that if users have an interest in making their own contributions (such as providing additional images, or offering further information about images), they would contact the site creators rather than directly making the contributions on the site itself. A Web 1.0 format is easier to design than a Web 2.0 site, and it allows creators to have creative control over the site and its contents. Vanderkam and Keller have done a tremendous amount of work in identifying the locations of images approximately 13,000 images from the collections of the San Francisco History Center. Building on that work, the San Francisco History Center has plans to further develop its own contributions to another Web 2.0 map project, Historypin. Historypin is perhaps the most ambitious of the current Web 2.0 mapping projects. In addition to features seen in the other projects discussed above, it also provides further options for user contributions – including upload of video and audio content. A few issues arise with the emergence of map-based collections of historic images. One issue derives from the very fact that there is more than one project: researchers have to keep track of multiple sites in order to search for images they need. A similar challenge had been faced by researchers searching for digital versions of rare books, which archives had previously uploaded to a bewildering variety of locations. These locations included their own websites as well as third-party hosts such as Google Books, the Hathi Trust, and the Internet Archive. Recently, archives have been increasingly collaborating to aggregate their content into consolidated sites (such as the Medical Heritage Library project) both to reduce duplication of effort as well as to improve ease of research. A second issue is copyright violations. Although the copyright of some historical images has expired, many site designers and contributors remain confused or uninformed about copyright law. Resources are available to clarify the copyright status of various works – one example is the excellent Copyright Chart by Peter Hirtle of Cornell University. Nevertheless, site users’ compliance with copyright law continues to be a challenge. Finally, there are risks associated with the content of user contributions. Site creators cannot easily control or monitor contributions, and those contributions can include everything from innaccuate information (such as incorrectly identifying the locations of images on a map) to libelous statements or other inappropriate content. This year, the OCLC Social Metadata Working Group is publishing a report for archives, libraries and museums to address the challenges associated with hosting user-generated content on their websites. The first of the three parts of the report is already available for free online. The projects considered here represent an ongoing attempt to improve access to historical images by making them available online, and by using crowdsourcing to geographically locate and describe those images. For more information about the projects, and to see how they continue to develop in both their features and content, please visit their websites: HistoGrafica, Sepia Town, WhatWasThere, Old SF, and Historypin.